After a brief transition period at the end of their season, TeamEN athletes turn towards making themselves faster 5k, 10, or half marathon runners and 40k time trial cyclists. We do this through relatively low volume, high intensity training, while leveraging the excellent endurance they already have at the end of their season. The low training volume gives them the recovery resources they need to absorb the high intensity training, to become faster, while also preserving their heads and Spousal Approval Units (SAUs) to be spent later when they are needed most — closer to their key races next season. 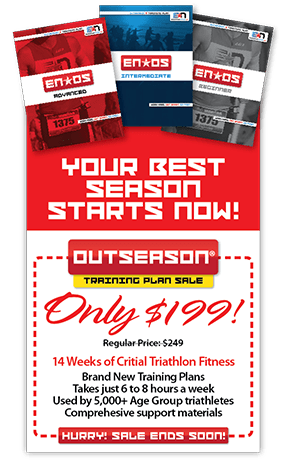 The result is that the Endurance Nation athlete finishes their OutSeason in either early February or mid-April much faster than their OffSeason counterparts or former selves. And that is the key: they are “out” of racing, not “off” from training, hence OutSeason vs OffSeason. We’ve tweaked, rewritten, and improved our OutSeason training plans every year since 2005, applying the training and coaching lessons we’ve learned, while also responding to the feedback of our athletes. For 2016 we’ve added a significant Running Durability component to the OutSeason training plans, increasing the running frequency and volume targets, while modifying the running and cycling intensity to accommodate these running goals. Over half of our Team of 700+ athletes began their OutSeason on October 26, 2015, using these training plans and members-only resources. And now we’ve made these new 2016 OutSeason training plans available to the public and on sale through December 31, 2015!